For example, on the search line (indicated by a magnifying glass), if you type a name, the client suggests names based on the user’s personal contacts and the global address list. From here, click and drag the contact to add the contact to a contact group. When this occurs, the person you added receives a notification that you added him and has the option to add you as well. When added, the contacts appear in the group you selected and you are able to see the presence information at any time. After a contact is added, you can move the contact from one contact group to another by clicking and dragging the contact. By holding the mouse over the name of the contact, you can see the notes he has set in his client, as well as his picture, as shown in Figure 1. Figure 1. Lync:Mac contact details. 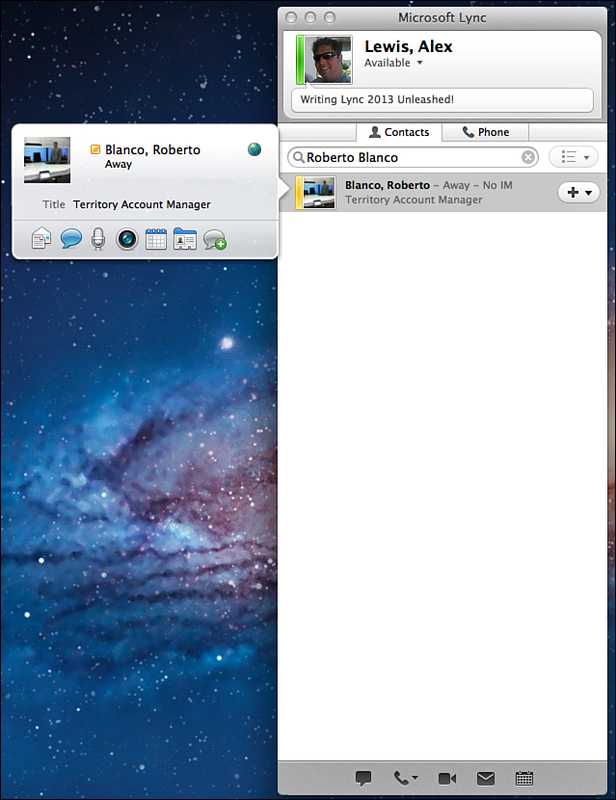 The Microsoft Lync:Mac client enables users to organize their contacts by placing them inside groups. By default, the group is Other Contacts. These groups show a status of how many contacts there are in that group and how many are currently online. For example, you might see Other Contacts (4/5) to indicate that four of the five contacts in that group are online. You can expand the group by clicking the hollow triangle to the left of the name to populate the full list of contacts. A convenient use of groups is to organize members of a project or department. By right-clicking the group name, you can choose to launch a conference call that will invite all members of that group. Similar functionality can be achieved by selecting multiple contacts by Control-clicking them and then right-clicking to choose Start a Conference Call. This call can use Lync’s PC-to-PC call features, through the PSTN or an attached PBX. 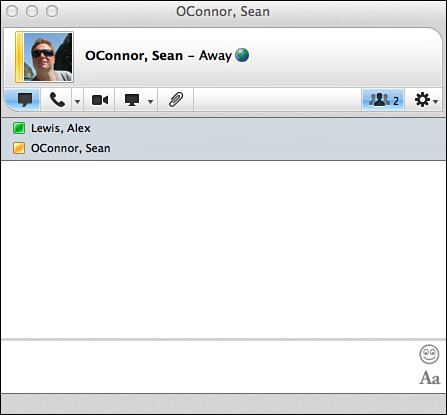 For most environments, the most commonly used feature in the Microsoft Lync:Mac client is Instant Messaging. This function enables users to stop cluttering mailboxes with “where do you want to go for lunch?” types of messages and enables users to limit their messages to only people who are likely to respond quickly. This also is where accurate presence information comes in handy. Starting an IM conversation is as simple as double-clicking a contact. Doing so launches the IM window, which defaults to the IM tab, as shown in Figure 2. The Lync:Mac IM client works much like any other IM client. You can see the status information for the person with whom you are communicating, and there are two areas in the window: one in which to type and one in which to display the conversation. Users have access to the usual features such as altering the font, color, and size of the text, as well as a menu of emoticons.